Confusion exists regarding the differences between brands of rice that include the word "Rose." 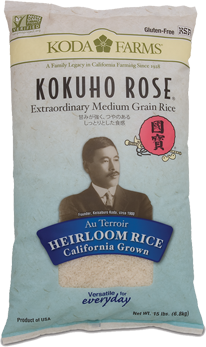 Less savvy consumers sometimes mistakenly think Calrose is the same kind of rice as Kokuho Rose®. After World War II, Cal Pearl, a short grain Japanese type rice, was the predominant variety grown in California. Two plant breeders, Hughes Williams and Jenkin Jones, co-developed Calrose, a medium grain Japanese type rice, from the Cal Pearl variety. In the 1950s, we employed Hughes Williams to oversee our rice breeding program. Mr. Williams brought his Calrose seed to South Dos Palos and conducted extensive crossbreeding for varietal improvement. His most promising cross with a Middle Eastern variety tasted much better than Calrose and possessed other desirable traits. Field yields and milling quality were high for that era. In ensuing years, this strain, known as KR55, was further perfected for our micro-climate and soil type through traditional selection. Today, "Calrose" is a coined phrase for high yielding, bland tasting medium grain rice. Williams/Jones' original Calrose was further developed (at the State rice research center in Biggs, CA.) primarily for higher yield with taste and quality as secondary considerations. Modern descendants have been packaged as "Calrose" since its initial introduction. While KR55 and Calrose do share a common ancestor, saying Kokuho Rose®, is a Calrose variety is like saying that a thoroughbred race horse and a donkey are the same thing. Our KR55 has been used in California rice breeding programs since the early 1960s. Upon the successful commercial introduction of Kokuho Rose®, the Koda family shared their seed with all the major rice breeding programs in California. Today, any medium grain Japanese type rice grown in California that calls itself "premium" has the KR55 strain in its lineage. An example of a modern, high yield descendant is Nishiki brand rice produced by JFC. Kokuho Rose is now approximately fifty-eight years old. The most highly regarded variety in Japan, Koshihikari (short grain) is of a similar age. The other significant Japanese short grain variety, Akita Komachi (about thirty-eight years old), is an early maturing but lesser quality version of Koshihikari. The best way to savor the subtle complexities our heirloom Kokuho Rose® is to steam your rice in an electric Japanese rice cooker. Steam cooking encourages the development of the full aromatic bouquet, the ever so slightly sweet flavor, and the tender texture of individual kernels. Japanese automatic rice cookers ensure consistent results by regulating the four variables of, the amount of rice to be cooked, the correct quantity of water needed to cook that rice, the steaming/cooking temperature, and the length of the cooking time. Rice cookers come with a measuring cup and this is used exclusively for measuring dry rice (not water). If you’ve inadvertently misplaced your measuring cup, just remember it’s equivalent to 3/4 “American” standard cup. The inner cooking vessels have coordinating water proportion lines printed or embossed clearly indicating volume. Washing, rinsing, and draining of the rice in advance of cooking is traditional, though not essential. In olden times, washing and rinsing was absolutely necessary to remove bits of debris and chaff. Wetting the rice prior to cooking also enhanced the overall quality and finished result. If you choose to wash your rice, then follow these steps. Measure the appropriate amount of rice into the cooking container. Add water to cover the rice, and agitate the grains using your fingers. The cloudy whitish color is simply naturally occurring rice starch. Drain the rice and repeat this process 2 or 3 times. The rinse water should be mostly clear now, and the water should be drained completely. Let rice rest 10 – 15 minutes (this step may be omitted if you're pressed for time). Now the rice is ready for the rice cooker. All rice cookers have makers' recommendations for the correct proportions of water to be added. Follow these guidelines. Purified water is recommended since any odd odors or tastes in tap water will transfer to the rice. When the rice cooker switches to the "off" position, do not open the lid. Unplug the appliance to cancel any further cooking or "warming" functions. Let the rice rest undisturbed for 10 – 15 minutes. This rest period will allow the cooker to vent any excess steam and moisture. At this time, open the lid and allow any residual steam to escape. Carefully savor the initial bouquet wafting upwards. What you'll experience in this initial fleeting moment is the culmination of years of effort to preserve the unique and sought after essence of our heirloom Kokuho Rose. Wet a "shamoji" (shah-MOH-gee), a rice paddle, to fluff and turn the steamed rice. Close the lid and if time permits, allow the rice to rest an additional few minutes. The rice is now ready to serve. Cooking Kokuho Rose on the stove-top yields good results, though not as consistent as those achieved with an electric cooker/steamer. Combine 1.5 cups of raw rice and 2 cups of purified water in a medium saucepan. Ideally, you should use a heavy-bottomed, non-stick pan with a tight-fitting, glass lid if available (the better to observe, as you do not want to remove the lid during the cooking process). Let the rice stand in the water 20 – 30 minutes. Do not drain. At this point, remove the pan from heat, lid intact, and allow the rice to rest undisturbed for a minimum of 15 minutes. Remove the lid, and gently fluff with a fork. Replace the lid and allow rice to rest for another 5 – 10 minutes. (These rest periods are helpful in the development of an overall uniform texture). Instructions for Preparing Heirloom Brown Kokuho Rose Rice in a rice cooker Rinse desired amount of rice (measured with cup supplied with cooker). Soak the rice in purified water to cover for approximately 20 minutes then drain. Place rice in cooker and add purified water to corresponding measurement line (which is conveniently impressed on the vessel's inner surface). Start the cooker. After the appliance completes its cooking cycle (depending on the individual cooker and amount of rice, ranging anywhere from 25-40 minutes), unplug it. DO NOT open the lid. Allow the rice rest undisturbed for a minimum of 15 minutes, and as long as 30 minutes. Open the lid, and gently fluff rice. Close the lid and if time permits, allow the rice to rest an additional few minutes. Rinse rice in a strainer under cold running water. Bring 2 quarts (8 cups) water to a boil in a large pot with a tight-fitting lid over high heat. Add the rice, stir briefly, and boil, uncovered, for 30 minutes. Pour contents of pot into a strainer over the sink. Let the rice drain for 10 seconds, then return it to the pot, situated away from heat. Replace pot lid and allow to steam 10 minutes. Uncover the rice, fluff with a fork, and season with salt. Place rice in a casserole with lid. Combine consommé, water, garlic salt, and butter in a saucepan and heat. When mixture comes to a boil, pour over rice and stir to combine. Cover casserole with lid and place in oven on middle rack for approximately 30 minutes. After 30 minutes remove from oven, gentle fluff rice in casserole, replace lid, and return to oven (heat turned off). Allow rice to rest undisturbed for approximately 15 minutes before serving. Variation: add 1/2 cup of sliced mushrooms to consommé mixture. In a small saucepan, stirring constantly, bring vinegar, sugar, and salt to a quick boil. Rinse, drain, and cook rice in an electric rice steamer in the usual method. Allow rice to rest for 10 minutes before opening lid of rice cooker. Open lid, gently fluff with rice paddle (shamoji) and close lid. Allow rice to rest for 10 minutes. Spread rice in a large shallow baking pan, then sprinkle with the vinegar mixture and turn rice gently with a rice paddle. Whisk together thinned wasabi, and oils in a bowl, then add crab, cucumber, scallions, pickled ginger, and toss gently. Gently fold mixture into rice. Halve, pit, and peel avocado and cut into 1/4" thick slices. Arrange avocado slices on top of rice mixture and sprinkle with nori strips and toasted sesame seeds. In a large, heavy saucepan (with a lid), heat the oil over medium-high heat. Add the rice and cook, stirring regularly, until the rice turns chalky and opaque looking, about 4-5 minutes. Add the salsa and stir for a minute as the salsa sears, releases its aroma and reduces a little. Add the broth and salt. Increase heat and stirring occasionally, bring to a boil. Reduce heat to very low setting and cook for approximately 25 minutes. Uncover, and gently fold rice from bottom upwards. Replace lid and allow rice to rest for 5-10 minutes. Before serving, gently fold the cilantro into the rice, fluffing the mixture. Soak the dried mushrooms in 1 cup very warm water for 30 minutes. Remove the mushrooms, strain and reserve the soaking liquid. Add the liquid to the vegetable stock and bring the stock to a simmer in a separate pot (hold the stock at a simmer for the duration of the cooking procedure). In a heavy-bottomed, wide soup pot, heat the butter, add the shallots, and cook over medium heat until translucent and soft. This will take about 4-6 minutes. Increase heat to medium high, add the rice and cook, stirring frequently, for a minute. Add the mushrooms and wine and stir constantly until the wine is absorbed. At this point, begin adding the simmering stock in 1/2 cup portions, stirring constantly until each increment is absorbed, before adding the next. Stirring constantly, finish cooking the rice in about 20 - 25 minutes. The rice should be tender but firm to the bite. Although there shouldn't be any extra stock left in the risotto, the consistency should be creamy and somewhat loose. Turn off heat and add 2 tablespoons of butter, the chopped parsley, and Parmesan cheese. Stir vigorously to thoroughly incorporate. Season to taste with salt and fresh pepper. In a saucepan, combine the milk, sugar, salt, and rice. Reduce heat and cook at a vigorous simmer. Gently stir constantly, until the rice is tender but not breaking apart and the mixture is still a little soupy but thicker than cream, about 20 minutes. Stir in the chopped chocolate and butter until well combined; the mixture will thicken. Just before serving, whip heavy cream into soft peaks and garnish individual portions. Soak rice in water approximately 20 minutes, then drain. Rinse rice with fresh water and drain in sieve for approximately 15 minutes. In a small saucepan blanch ½ cup pistachios in boiling water 3 minutes, then drain in a sieve. Rinse pistachios under cold water and pat dry. Rub off pistachio skins and chop pistachios coarsely. In a heavy, medium-sized saucepan melt butter over low heat and cook cardamom, cinnamon, nutmeg, and sugar, stirring, 1 minute. Add rice, milk, and cream. Increase heat to medium and simmer gently. Cool mixture before folding in pistachios and bananas. Coarsely chop 1/4 cup chopped pistachios and garnish individual servings.